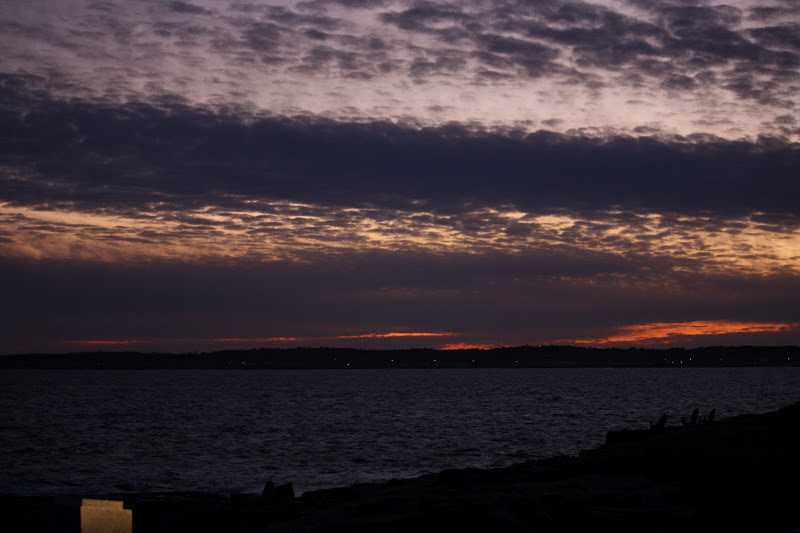 Neddick “Nubble” Lighthouse in York, Maine. Photograph by Suzanne Shoemaker. 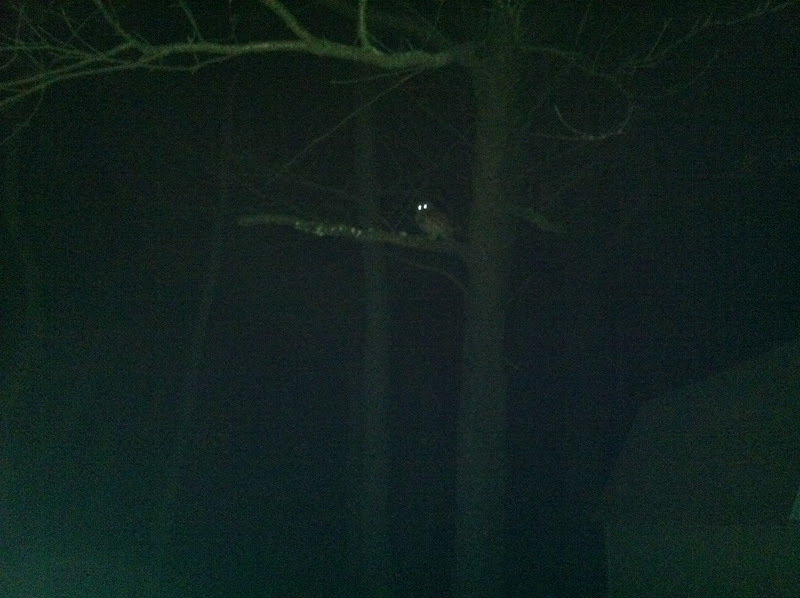 Winter is typically the slowest season in wildlife rehabilitation. Nesting season is long past, and the young that survived to fledge, and passed the early tests, have grown wiser and gained the hunting skills that will hopefully carry them through a normal winter. In harsh winters with deep snow cover, such as New England had in 2010, many birds simply can’t find enough food to eat, and rehabbers receive them in a weak and emaciated condition. But Maryland winters are not usually harsh, and snow melts fast, so winter is the time for rehabbers to catch up on paperwork and do the maintenance and improvement projects that we just don’t have time for the rest of the year. It is also the only opportunity we have to take a vacation. I see a lot of different owls in my line of work, but never in my life a snowy owl, so with all the news of the snowy owl “invasion”, or “irruption”, this winter, and with a favorite sister living in one of the hot spots in Maine, I couldn’t let this opportunity slip by. It was time for a vacation, albeit a short one. 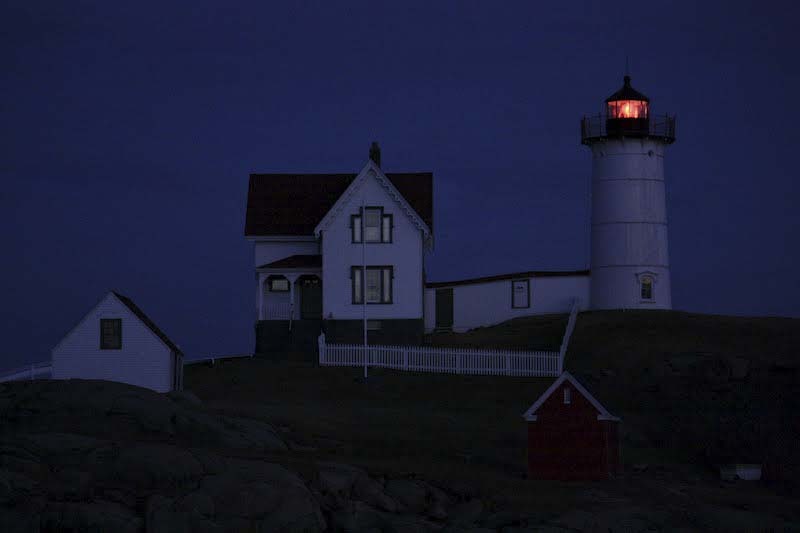 My sister Janet and her partner, Josh, did all the research and scouted out the surest place to find a snowy, Cape Neddick “Nubble” Lighthouse in York, Maine. I got a cheap seat on a flight to Boston for January 27th and off I went. Sunrise on the Water. Photograph by Suzanne Shoemaker. I had a great time visiting with Janet and my other family in Massachusetts the rest of that day and night, and we left for Maine the next morning, first stop: Nubble Lighthouse. The snowy owl had been reported there on January 26, but it was not to be seen early in the afternoon on the 28th. We decided it may yet be there, just on the other side of the rocks, so we left for lunch and returned at dusk, hoping she would become active and show herself. Temperatures dropped as the sun went down, and the wind grew strong. We enjoyed a beautiful sunset. We were about to leave when a white owl flew up from the far side of the island and was whisked off with the wind over the water to the northwest and out of sight. Now we knew the snowy was still there. We planned to return with Josh the next morning at sunrise. 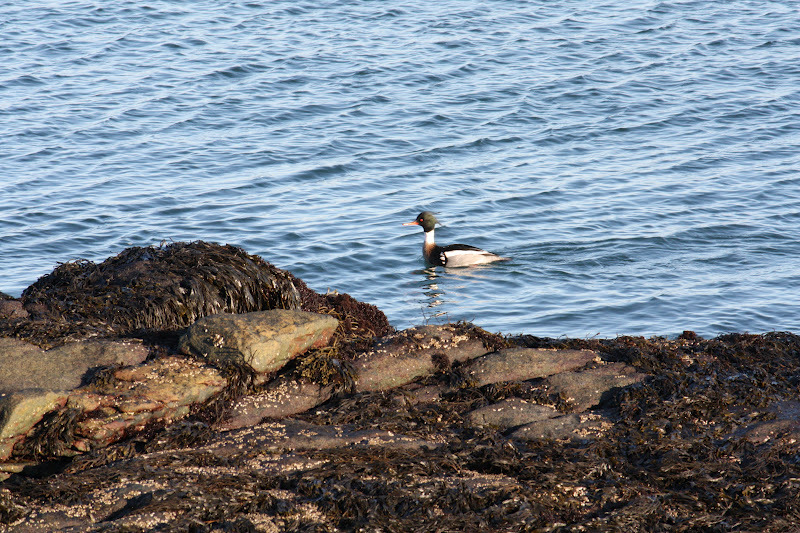 Common Merganser. Photograph by Suzanne Shoemaker. We arrived about a half hour after sunrise and there was the snowy, plainly visible in the early light, sitting on the rocks on the lighthouse island, apparently finishing an unidentified breakfast. She was close enough to see clearly through our binoculars and scope, but sadly not close enough for my camera lens. We watched as the snowy groomed and looked around, and around, and around, and around, for over two hours. Then she began walking around, and looking up. I got my camera ready in anticipation of some action. She suddenly took flight and flew nearly the whole length of the island, then landed on the rail of the lighthouse walkway fence. 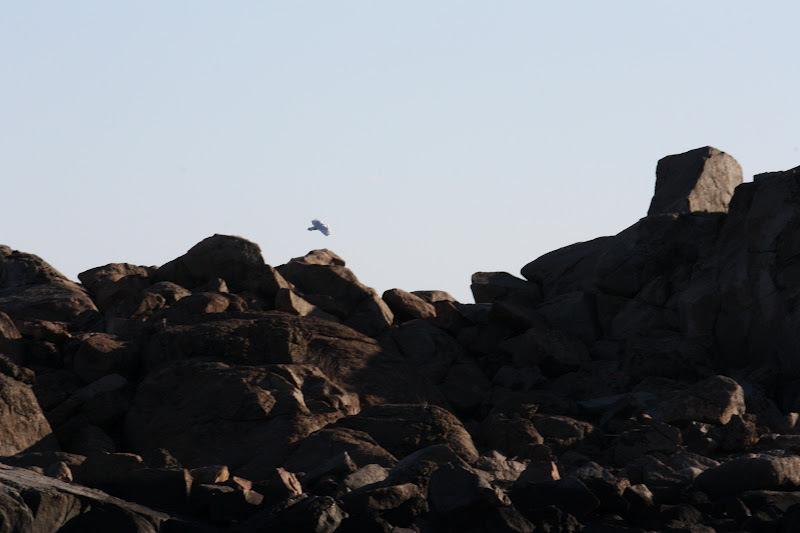 She perched a minute or two longer before dropping down out of sight behind the rocks and the keeper’s house. Alas, that was the conclusion of my first snowy owl experience, but definitely a successful trip! Back at Owl Moon Raptor Center, my husband Jan was kindly caring for the current crew. I am pleased to report that no new patients have arrived since I last wrote, and none of our current patients are receiving treatments. It is a matter of maintenance: preparing food, feeding, replacing water, and cleaning up after them. Thank you, Jan, for a weekend off. 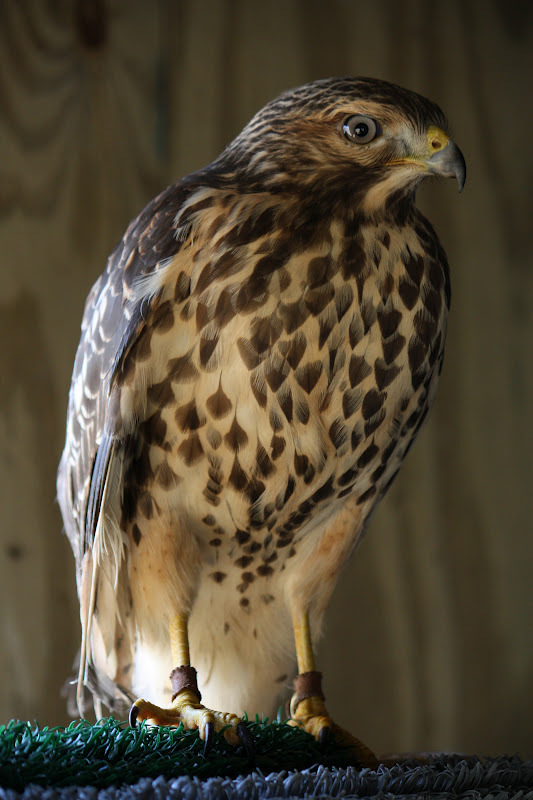 In the outdoor mews, we have the three red-shouldered hawks: Squeak-toy, Soldier-girl, and Rufus in one; and the two barred owls: Mystery and Cheerio, in the other. We are following up on a lead to find Squeak-toy a permanent home as an education bird, a duty for which he is well suited. He is young and adaptable, and has become quite comfortable and tame in human company. Soldier-girl went to Dr. Barb at Opossum Pike Vet Clinic this week for a follow-up examination. The good news is that she has recovered some capacity to grip her left foot, and she may recover more as her bone “remodels.” The healing process continues. She is still weak in that leg, however, and prefers to lie down at night. We will not know if she is a release candidate for a few more weeks. Rufus is being allowed time to adjust to seeing with just one eye, which could take weeks, or even months. We will begin flying him after another week or two. We have been creance flying Mystery and Cheerio nearly every day, in preparation for their release. They have been flying well, growing stronger and gaining stamina, and we plan to release both when the weather improves this weekend. We will take them back to their home territories, where I look forward to sharing the joy of their release with the kind people who rescued them. I hope to have photos of their release to share with you all next week. Snowy Owl in Flight. Photograph by Suzanne Shoemaker. 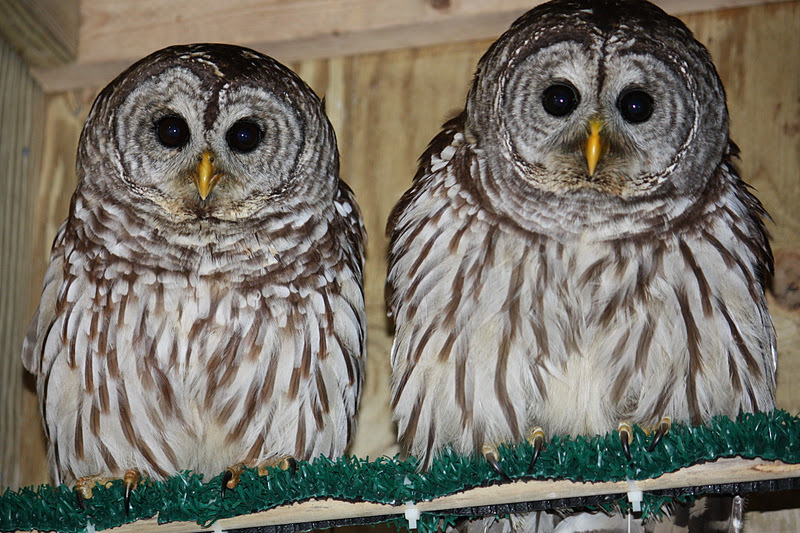 Allow me to introduce to you, “Mystery” and “Cheerio,” two female barred owls who joined us this month. Mystery’s condition is, as her name hints, a little mysterious. She was transferred to Owl Moon from Second Chance Wildlife Center on January 5th where Daniel and Patti brought her 11 days earlier after they found her “unable to move” in their yard in Monrovia, MD. Mystery was weak and lethargic, and very dehydrated upon her arrival, but otherwise she appeared in good physical shape. She was a healthy weight, even somewhat plump. The color of her mucous membranes (roof of mouth, “gums”, and underside of eyelids) was a normal pink; and no wounds, fractures, or other injuries were evident. The only remarkable aspect of her condition was a rather heavy infestation of parasites. Hippoboscid, or “flat” flies are an unpleasant external parasite that is commonly seen in raptors, though not normally in these numbers. Hippoboscid flies reside under the feathers and make their living sucking blood from the skin. Mystery also had a high number of feather lice, which feed on the feather vanes and the blood in the quills of growing feathers and can be quite an irritation. Mystery was treated with a mild insecticide to kill the flies and lice. 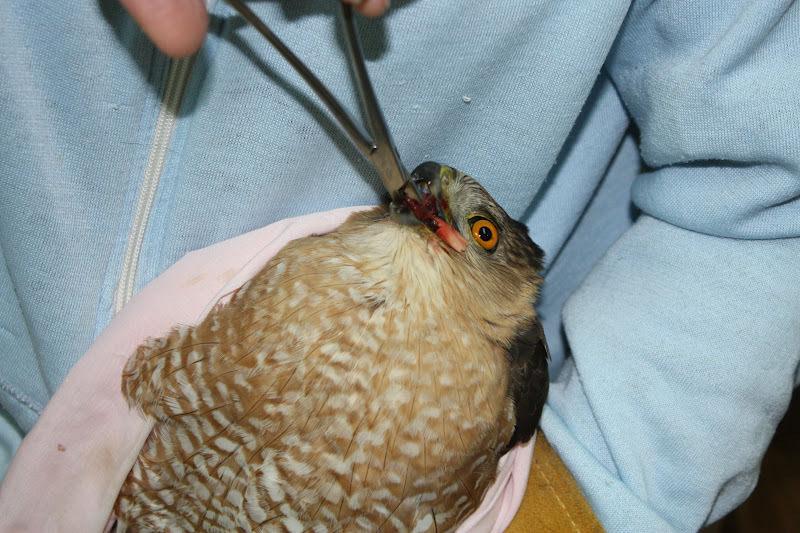 While ectoparasites can be a serious problem, they are not likely the reason why Mystery wound up in rehab. A healthy raptor can usually keep a parasite load in check. It is when one gets sick or injured that the parasites get the upper hand. Ectoparasites themselves would cause a slow decline, and symptoms such as anemia and weight loss, none of which Mystery had. It is possible that she had been hit by a car or suffered another trauma; perhaps a concussion, and her symptoms were no longer evident. The cause of her decline will likely remain a mystery. Second Chance treated her with the “catch-all” non-steroidal anti-inflammatory (NSAID) drug. Maybe the NSAID’s helped, or maybe she just needed some time. Whatever the reason, Mystery has since recovered nicely. She has regained her strength, is eating well, and flying in the outdoor mew and on the creance line with vigor. We want to allow Mystery more time to build strength and stamina, but I expect to be able to return her to her home in Monrovia soon. 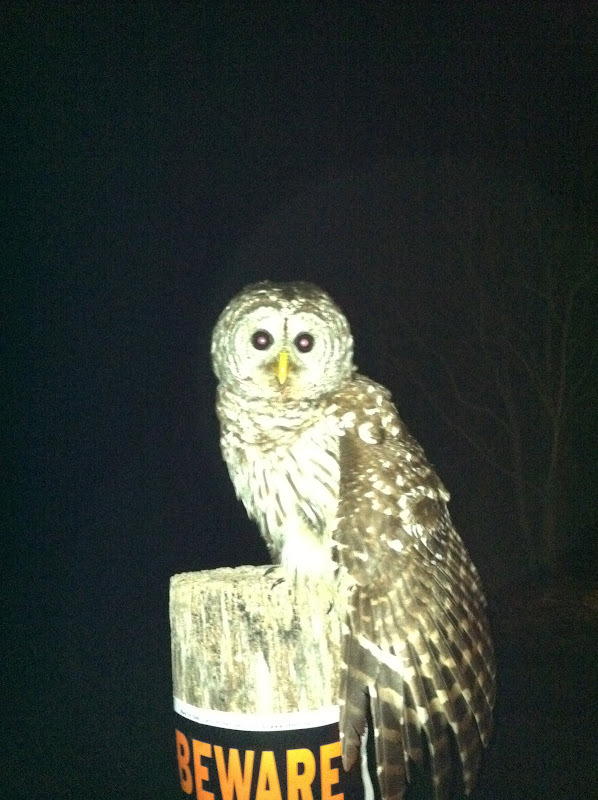 Owl Moon’s other barred owl, “Cheerio,” (named by my 3 year-old grand-niece, Sophia) is also recovering well. Cheerio was discovered by Gary, who found her in his driveway in Petersville, MD, after returning home from working a night shift early Friday morning, January 20th. He brought her indoors and kept her in a box in a warm, quiet place until evening. I met him on his way back to work that evening and transferred her to Owl Moon Raptor Center. Cheerio was presumably hit by a car. She had a concussion, a bad bruise on her left “forearm,” and was lethargic, dehydrated and in pain. We are treating her with the usual NSAID, and she is responding well. She is not eating on her own yet, but she is being hand fed a normal diet of mice and quail, and acting plenty feisty when we need to give her treatments. We plan to move her to the outdoor mew with Mystery in another day or two, where Mystery can remind her how to feed herself! I have saved the best news for last! I am pleased to report that beautiful Pasadena, the red-shouldered hawk with a wing fracture, is now flying free in the town from which she took her name. Matthew and Crisdee were present, as was their son, Holden, and Crisdee’s mom and dad, Pandee and John. All were involved in Pasadena’s rescue. 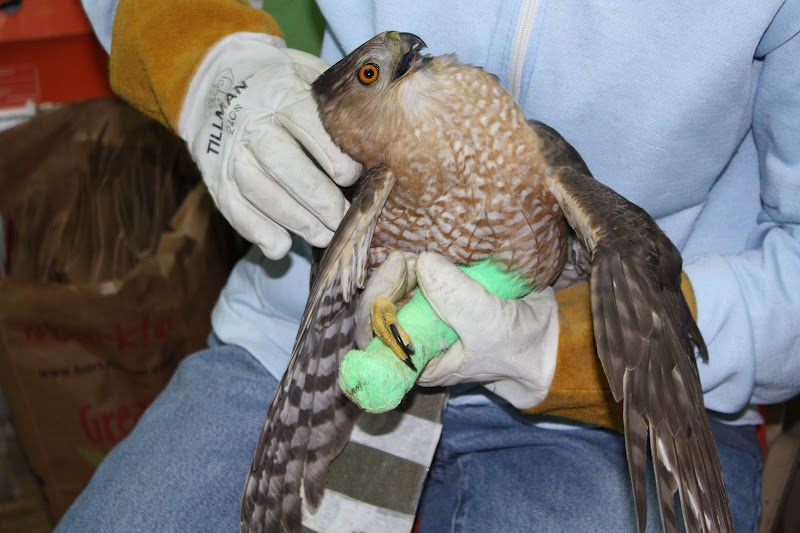 Crisdee was the one who had bravely captured the injured hawk, so I asked her if she would like to do the release. She was game, but Pasadena bit me as I was getting her out of the carrier, so rather than pass a biting bird to Crisdee, I ended up letting her go myself. We released Pasadena from Matthew and Crisdee’s back deck, which has a lovely expansive view of the sky. When she took off we could watch her go for a long while. She flew high and didn’t stop until she reached a tall tree in the distance. Then she took off again and circled high, surveying her surroundings before landing on another tall tree. It was wonderful to watch. Matthew filmed the release with his phone, and you can see he did an admirable job, but Pasadena was faster than Matthew and she quickly flew out his view.